Many cruisers dream of making that big cruise when they retire - heading off into the sunset for an indefinite period. Others plan a sabbatical from work planning to return after the big adventure. But nowadays with the improved technology for keeping plugged in while out there - it may be possible to move one’s business out of the house and onto the water. We have seen a number of people trying this over the last few years and I thought it might be of interest to examine the possibilities. Could this be your office? Internet is obviously the most important factor in staying in touch. Over the last year we have been in range of high speed internet for almost all our cruising. So anyone sending us emails need have waited no more than a day of two for a response (if it was urgent!). We do not use any form of satellite or HF radio as I think these are too slow. We use data access through the phone networks, getting a local data plan in each country. Here in Ireland I got a pay-as-you-go data plan for my iPhone 4 as soon as we arrived. We pay 10Euro for 2GB of data over one week. The SIM was just 10Euro as well. Not all countries are as accommodating however so it pays to check where you plan to cruise. Denmark would not let us have a data sim for some reason. The iPhone has been brilliant. Using "data tethering" I have set it up to provide data access to our two laptops. This means both our computers are on the internet all the time for just 10Euro per week here. In the event that you can’t get data through the mobile phone then you will be using wifi. This is ok as well but less convenient since you generally need to get a new access at each port. This can be a reasonable deal if you stay put in one marina for a while as they often charge a sensible price per week/month. Daily access can be quite costly. Gone are the days of picking up someone’s unlocked wifi. We haven’t seen a free unlocked wifi for some months. And if you do find one you might wonder about wonder about the security risk. Stick with legitimate wifi or a 3G data plan through a mobile phone network. 4 words... pay-as-you-go. Assuming you travel on a boat sailing (or powering) from country to country at leisurely pace you will be in a country long enough to set up a local phone access by getting a local SIM card. To do this you need an "unlocked phone" otherwise it will not accept different SIM cards. With your new local number you will have free incoming calls and reasonable calls both locally and to countries around the world. Your definition of reasonable may vary - but as we come from Canada with notoriously high phone rates everything looks reasonable to me! If you need to make very long calls there are usually deals to be had for particular countries. The one problem of getting a new local SIM at each country is the fact that people might not know which number to call you on. There a number of solutions for this depending on our needs. Skype offers an incoming number which I know numerous people have made use of. This year we just kept our UK mobile number active - roaming as we visit other countries. Then when we receive a long call we just ask if we can call back using our local number. Sending parcels and post out is obviously no problem. But receiving is a bit trickier as we keep on the move. We generally wait until we are certain we are going to be visiting a specific marina - then call them and ask if we can have them receive mail or a package. People at home are generally thrilled to receive a package or mail with foreign stamps. So unless you are trying to pretend you are still sitting in an office tower, the occasional difficulty of forwarding a package will not likely be an issue. If your business requires trips home or to clients that has also got easier in our experience. 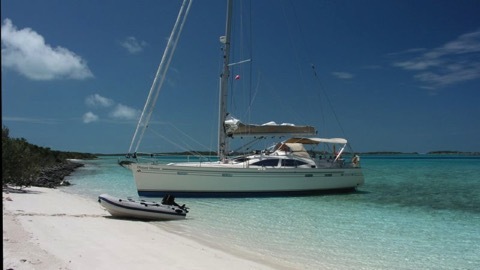 We book flights online and often return for a few weeks up to few months - leaving the boat in a marina or hauled out. Many marinas around the world are set up to handle people hauling out or leaving the boat temporarily. Check with other cruisers in your intended area. Seven Seas news letters have also been a good source of info for places to lay-up the boat. Nowadays there are so many improvements to electronics and computers it is easy to keep an office afloat. We have made a few improvements in the boat - and in our business procedures. A bigger battery bank means we can sit at anchor and run computers on a rainy day. We have a small built-in diesel generator (Mastervolt whisper 3.5). A small printer can connect by wifi to both our computers. And because we are on a boat we are extra careful to backup our computers and data! Backup disks are small and cheap these days. So there you are - sailing with your business. Nowadays there are many business people who might be able to move their office on board. And get out cruising before retirement.